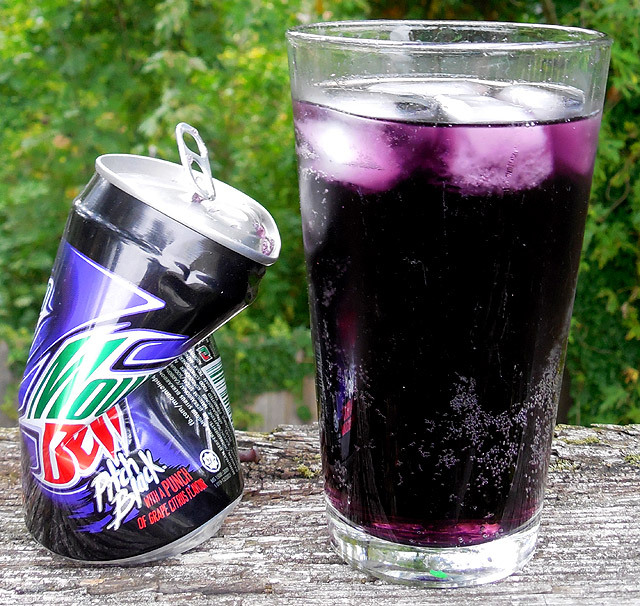 Mountain Dew Pitch Black is BACK! | Dinosaur Dracula! Okay guys, I have some big news. But before you get too excited, there’s a pretty major catch. Yup. No joke. That’s a 2013 can of Halloween’s unofficially official soda. You’ll need to import it from freakin’ Malaysia. There are exactly two things I know about Malaysia. One, its phonetics make me think of Nate Fisher’s daughter. Two, they have motherfucking Mountain Dew Pitch Black. It’s not as bizarre as it sounds. If you’ve spent much time studying soda, you know that there is very little in the way of “global” rules. What doesn’t sell here might be hotcakes in China, and what we love might be anathema in Germany. Soda companies can’t force all of their brands on every nation. They have to take the trends and tastes of each region into consideration. There are brands that you consider “long dead” enjoying massive success overseas, and there are brands that you’ve enjoyed for years that have never touched foreign soil. I couldn’t possibly guess at what led to Pitch Black’s revival in Malaysia of all places, but I wanted in. I won’t tell you how much I paid to import a few cans, but suffice to say, I won’t be buying new sneakers this month. I HAVE PITCH BLACK. NEW PITCH BLACK. FRESH PITCH BLACK. 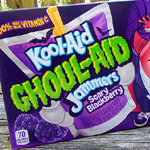 Best as I can tell, the formula is 100% “original” Pitch Black – not the extra-sour sequel. 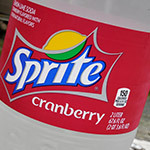 It tastes like Mountain Dew mixed with Grape Fla-Vor-Ices, with a sort of spicy bite. Above all else, I love the color. I’ve missed that deep purple so, so much. Though I have a stock of every incarnation of Pitch Black (three different, by my count), this is the first time in a long time that I’ve had a can that’s undeniably safe to drink. And yet… drinking it was never really on my radar. No, this soda means something more. 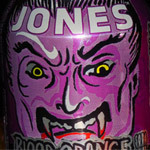 I started the Halloween Countdown in 2003, but it really picked up steam in 2004 – the same year Mountain Dew Pitch Black debuted. 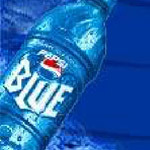 It quickly became more of a symbol than a soda for me. Pitch Black taught me that Halloween was still worth getting excited about, and that its allure wasn’t only as simple as “costumes and Charlie Brown cartoons.” If you looked around, the season still had so much to offer – no matter your age. 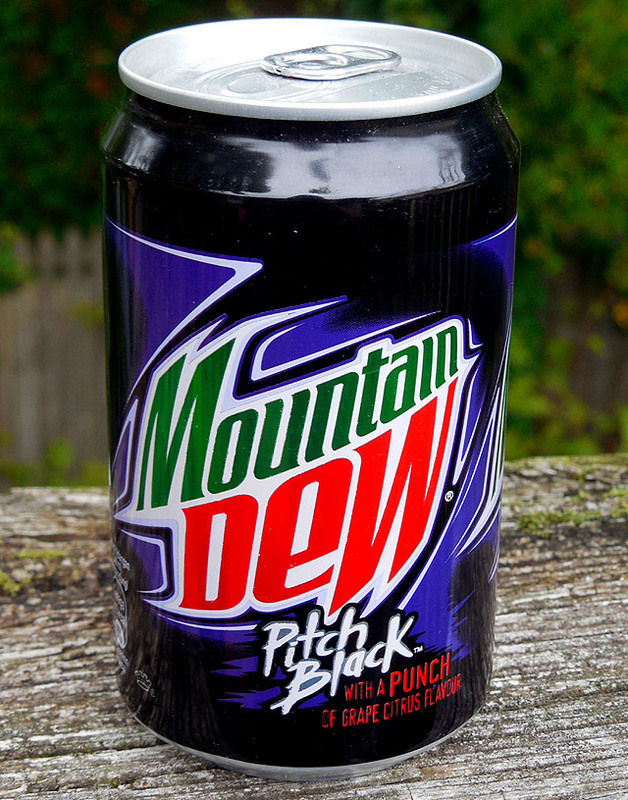 Mountain Dew Pitch Black II came out in 2005, and I was there to cover it. The saga continued in 2006, with a Target-exclusive Pitch Black ICEE. (I was lucky to find that one. Back in 2006, Target hadn’t yet made its mark as the Halloween capital of the world.) I was even on top of its short-lived revival in 2011. The point is, I have a ten year history making a fuss about Halloween online. Throughout most of it, Pitch Black has been my mascot. A constant source of inspiration, and even as I write that, I realize how weird it is to write that. 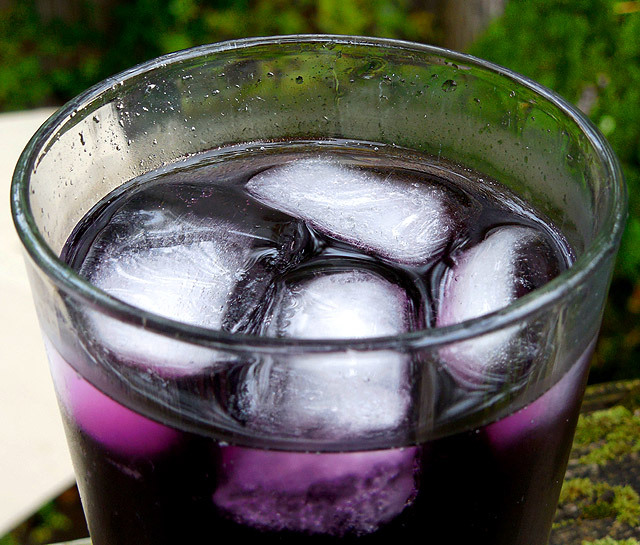 “It’s just soda,” many of you will think. NO. IT’S NOT JUST SODA. Do I wish Pitch Black was available in the States? Of course. 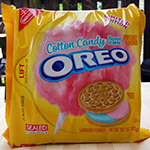 And I still hold out hope that it’ll come back someday, because clearly, the flavor isn’t totally dead. 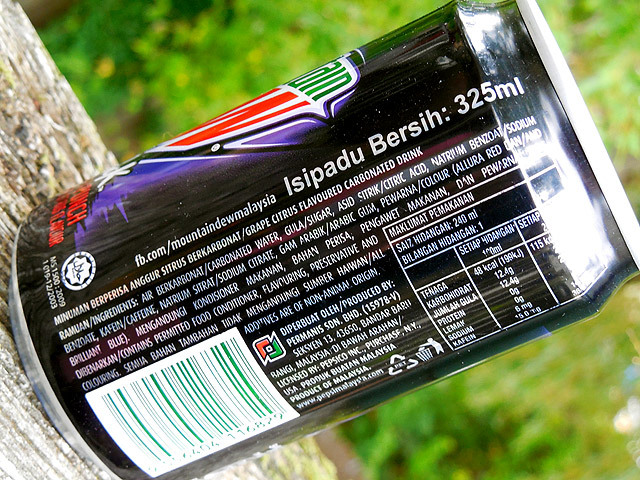 Still, even with the expense, I love the fact that these cans came from Malaysia. Obtaining them was an experience, and when I drink this, it’s fun to remember that it was actually meant for mouths 10,000 miles away. I feel like I’ve made a tear in the space-time continuum. It feels good! I’m not going to encourage everyone to go find some Malaysian eBayer with cans of Pitch Black to spare. I realize that this stuff means more to me than it does to most, and that’s okay. Hey, every Halloween season, there are things we all share in. Things we enjoy together. But then there are more personal experiences, and sometimes, that’s what we remember most. Of course I’m going to remember the 2013 season for its revival of Frute Brute and Fruity Yummy Mummy. Everyone is. But I’m also gonna remember it as the year I spent (redacted) dollars to get Malaysian soda shipped across thirty-seven oceans. I’m happy about both of those things. While I was taking these photos, I made a new friend. 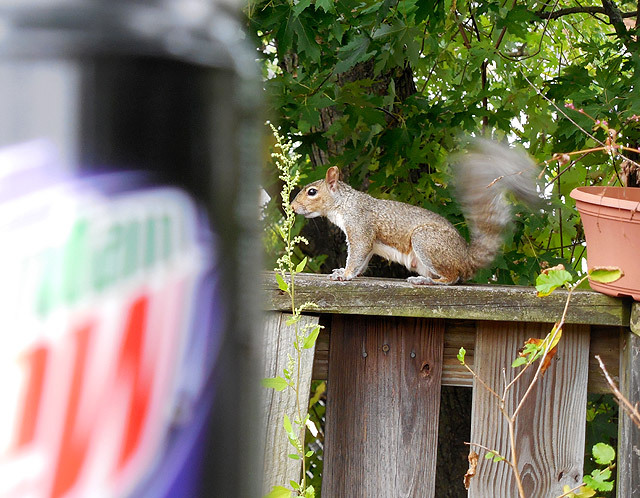 Say hi to Paul the Squirrel. He’s nuts! 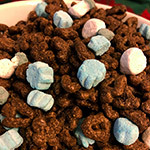 2018’s Hottest Holiday Junk Food!